There was no time to rest, even after our three day tour of the Bolivian desert. First thing the next morning, we were on the bus to Potosi. Yann had recovered well and we had received the good news that 67% of voters had supported Evo Morales in the vote of confidence referendum (that had taken place while we were on the tour). 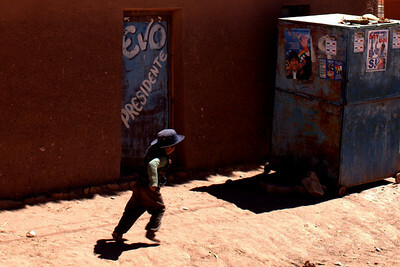 In the western highlands of Bolivia (where we were traveling), where the population is poor and mainly indigenous, support for Morales was even higher. 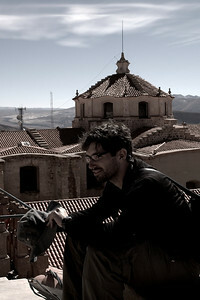 We arrived in Potosi in the late afternoon. 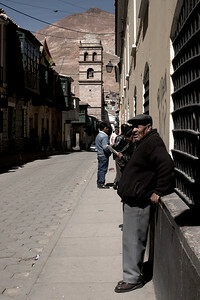 We made our way through Potosi's cobblestone alleys, past its crumbling colonial mansions and dozens of churches, admiring the massive Cerro Rico mountain that seems to loom over the city from wherever we were standing. Potosi has a grand and terrible history, and tourists come here for glimpses of the vestiges both of grandeur and of terror. 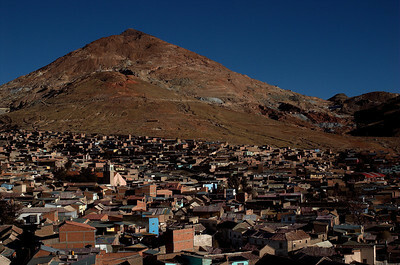 Four hundred years of history has shaped Potosi into a city where the divide between the rich and the poor is even more present than in other parts of the country. 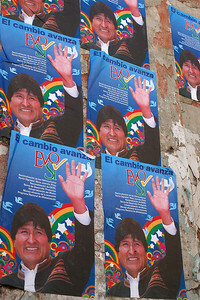 (Perhaps why Morales and his Movement for Socialism Party enjoy over 80% support, the most of all prefects in Bolivia). It was established as a mining town in the 16th century and quickly the Spanish discovered that the nearby mountain was full of silver ore. The Spanish removed 45 000 tones of pure silver from the from what seemed to be an inexhaustible source of silver. Thousands of native Quechua and Aymara people were enslaved, and sometimes forced to live underground for 3 months (until they died). When the native population had been decimated (hundreds of thousands are said to have died in the mines), African slaves were shipped to Potosi to continue the work. An estimated 30 000 African slaves died, and rather quickly, due to the 4000m altitude. At the height of silver excavation, the population of the city swelled to over 200 000, making it one of the world's biggest cities. It is even mentioned in Cervantes' Don Quixote "I were to requite thee as the importance and nature of the cure deserves, the treasures of Venice, the mines of Potosi, would be insufficient to pay thee." By the beginning of the 19th century most of the silver had been depleted and the city began to decline. 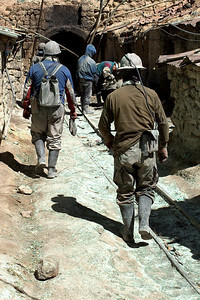 Today, there is almost no silver left in Potosi, neither in Cerro Rico or in the museums and churches. Most is in Europe. We did the mandatory visit to the Potosi Mint, a testimony to Potosi's previous position of power, the coins for most of Europe were produced here for over a century. We visited a handful of churches, mostly for the great views of the city from their rooftops. And we visited museums and developed a particularly liking for some of the Bolivian artwork. 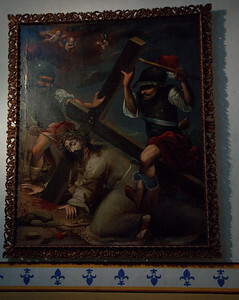 We noted the common theme of Spanish conquistadors crucifying Jesus, which, given Potosi's history is quite an apt representation. On our second day in Potosi, we decided to witness what remains of Cerro Rico mining. We took a popular "Mine Tour" with a local company. For 10$ you get a trip to the mining quarter of Potosi (including the miner's market), then a refinery then a visit inside one of the dozens of cooperative mines that operate in the old tunnels of Cerro Rico. Before heading to the market we were first fitted with ridiculous suits, hardhats and lamps. The lamps and hardhats proved to be useful, but the rubber coveralls just served to highlight our invasive presence in the tunnels. We paraded through the small miners' market purchasing "gifts" for the miners on the insistence of our guide. Gifts included soft drinks, coca leaves and sticks of dynamite, all three available at most market stalls. 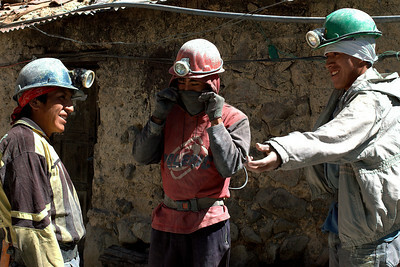 Miners purchase all of their supplies themselves, hence the absence of any sophisticated equipment (including masks). Mines have been stripped of most of their wealth and ore is extracted with the hope of having a high enough mineral content to make decent money. Each cooperative works in teams sharing their meager profits. 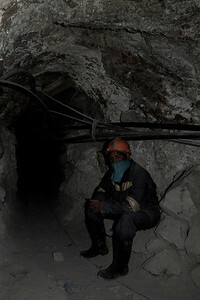 Miners are mostly uneducated and indigenous and are forced into mining by circumstance. Small children, boys and girls, enter the mines young, as they are able to crawl to small hard to reach corners. Miners usually die within 15 years of entering the mines, from silicosis (caused by the inhalation of large quantities of silica dust). We arrived at the Candeleria mine around lunch time, and workers were preparing to enter the mines for the beginning of their 12 hr+ shift. They prepared their painfully rickety equipment and put on their cloth masks and we watched them enter the mine. Shortly after, our group of about 8 people entered the mine behind them. We were accompanied by two guides, one to lead and the other to help people out if they began to feel uncomfortable. 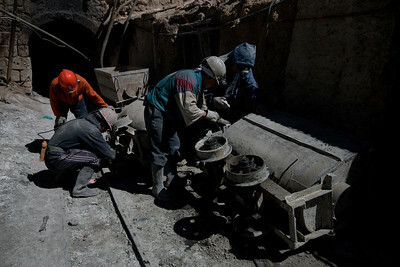 The first few hundred meters of tunnel is wide with high ceilings, it is dark and extremely noisy, due to the hydraulic pipes used to power the carts. The air is stale and stinky, the tunnel is hot and your lungs begin burning almost immediately after entering. It took us about 10 minutes to get to the end of the main tunnel with the ceiling at which point we sat and rested. We were given a description of the following part of the mine. We would descend a few meters at which point we would enter a tunnel in which we would have to crawl until we reached the second level of the mine. Yann had to be convinced to take this tour, and when we turned the corner and watched as people began entering the tunnel on their hands and knees he turned around to leave. Another tourist had already dropped out ahead of him and our guide left with both of them. I was the last person in our convoy. With just the slight descent further into the mine the temperature had already risen and us inexperienced tourists were kicking up dust everywhere around us, (much to the dismay of the miners that had grumpily joined the queue behind me). It is hard for me to describe the smells and the discomfort of my few minutes crawling through the tunnel. About halfway through the tunnel, I turned around and crawled back, despite the encouragements of my fellow tourist next to me. I knew that if I got to the end of the tunnel I would eventually have to turn back and do it again. I raced out of the mine (as fast as I could), out of breath and afraid. Outside the mine Yann and I sat in silence covered in dust and feeling pretty lame dejected as we watched a group of even young miners getting ready to enter the mine. For a wonderful portrayal of the lives of Potosi miners we strongly encourage you to watch "The Devil's Miner" a heartbreaking documentary about mining in Cerro Rico filmed in 2005. You experience makes me think of the movie"Germinal" by Emile Zola which tells about the beginning of unions among miners in France.